When I think of aromatherapy, I typically imagine incense wafting through the air, candles burning, or essential oils streaming out of a diffuser. One substance that doesn’t generally spring to mind? Playdough. The tangy smell of industrial-park-meets-home-baking isn’t something I’d normally seek out as part of an enjoyable sensory experience. However, when made at home with a few simple ingredients and your choice of essential oils, DIY playdough can be a fun, unique way to experience the benefits of aromatherapy. Though other forms of aromatherapy bring relaxation and rejuvenation, they involve only one of the senses. Aromatherapy playdough, on the other hand, engages not just your sense of smell, but your sense of touch, too. It’s a wonderfully tactile physical experience for the hands, and a wide-open space for the imagination. As someone who suffers from anxiety, I’ve found playing with it to be especially therapeutic — like squeezing a scented, moldable stress ball. With the right essential oil, it may also be helpful for arthritis, sinus congestion, or any number of conditions relieved by aromatherapy. When buying an oil, look for “pure” oils and note that some oils can be irritating to some people. Learn more about choosing the right essential oil for you in this 101 guide, or find more on essential oils for anxiety, sinus congestion, headaches, or pain. Mixing the dry ingredients for DIY aromatherapy playdough. Begin by measuring the dry ingredients: 1 cup flour, 1/2 cup salt, and 2 teaspoons cream of tartar. Mix together in a large saucepan. Mix in the wet ingredients (except essential oil) well — food coloring optional. Then it’s time for the wet ingredients (except the essential oil): 1 cup water, 1 1/2 tablespoons olive oil, and a few drops of food coloring. Add these to the saucepan and mix well. Since I prefer the soothing scent of lavender, I like to make my playdough a pale purple to match. Those sensitive to food dyes may choose to leave food coloring out, or opt for a natural alternative. Place the saucepan on the stovetop over medium-low heat. Stir constantly until the mixture begins to clump and form a ball. Stovetops vary, but this may happen faster than you expect —about 5 minutes or less. Remove the ball of dough from the saucepan and set on a sheet of parchment paper to cool for a few minutes. I find the warmth of the dough adds to the sensory experience, so I like to get my hands on it pretty quickly — but be careful the dough isn’t too hot to handle before you proceed. Adding in calming lavender essential oil. Add a few drops of your choice of essential oil into the dough. 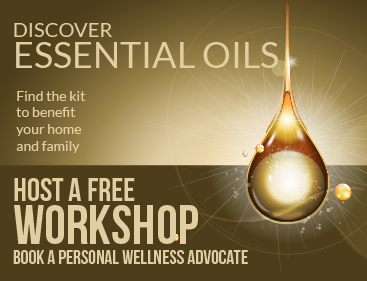 The amount you use will depend on the strength of the oil you’ve chosen and your own preference. Start with about 6 drops and add more, if desired. Knead the oil into the dough to distribute. You’ve now made aromatherapy playdough! This homemade variety can be used just like commercially-prepared playdough, and has a texture that’s every bit as satisfying. Whether you choose a calming lavender, an invigorating peppermint, or any other essential oil, the pleasing scent plus squishy goodness makes this a delightful DIY. Store in an airtight container and use within one week. Playdough recipe adapted from The Prairie Homestead. Sarah Garone, NDTR, is a nutritionist, freelance health writer, and food blogger. She lives with her husband and three children in Mesa, Arizona. Find her sharing down-to-earth health and nutrition info and (mostly) healthy recipes at A Love Letter to Food. Win Wellness CORE RawRev + Freeze-Dried Treats!